Happy October! My favourite month of the year has finally arrived. For the next month I’ll be making as many Halloween inspired paintings as I can. But, I’ve also decided to take part in Inktober 2018. As the name suggests, Inktober most definitely involves using ink. I’m an acrylic sort of gal and I’d be lying if I didn’t say that moving to a completely different medium is a little daunting. On the plus side though, it will be good practice and something new to try. So, What exactly is Inktober? Artists (and non-artists) from around the world, pick up their pens and create 31 drawings. One for each day of October. Then they share their creations on social media making sure to tag it with #inktober and #inktober2018. Fineliner, biro, dip pen. As long as it’s ink it counts! You can come up with your own ideas to draw each day, or there’s an official prompt list which you can follow. Drawing is meant to be fun, so if you don’t think you can manage all 31 days, you don’t have to. It’s the taking part that counts. I’m following the official prompt list. Mainly because there are a lot of words on there that will work well with cats. I’m aiming to have a cat (and the prompt) in every drawing, and I’m also aiming to do all 31! It’s going well so far. Some are better than others and I’m learning new things with each one I complete. My little ink drawings are also available to buy. On a first come, first served basis. To buy you say! How do I get one? Leave a comment to say you are interested. I’ll get back to you and ask to DM me your email and location (if drawing is still available). Once I get that information I’ll send you an invoice via PayPal. I’ll post your drawing out as soon as I can after I receive payment. These drawings are £10 each plus postage. 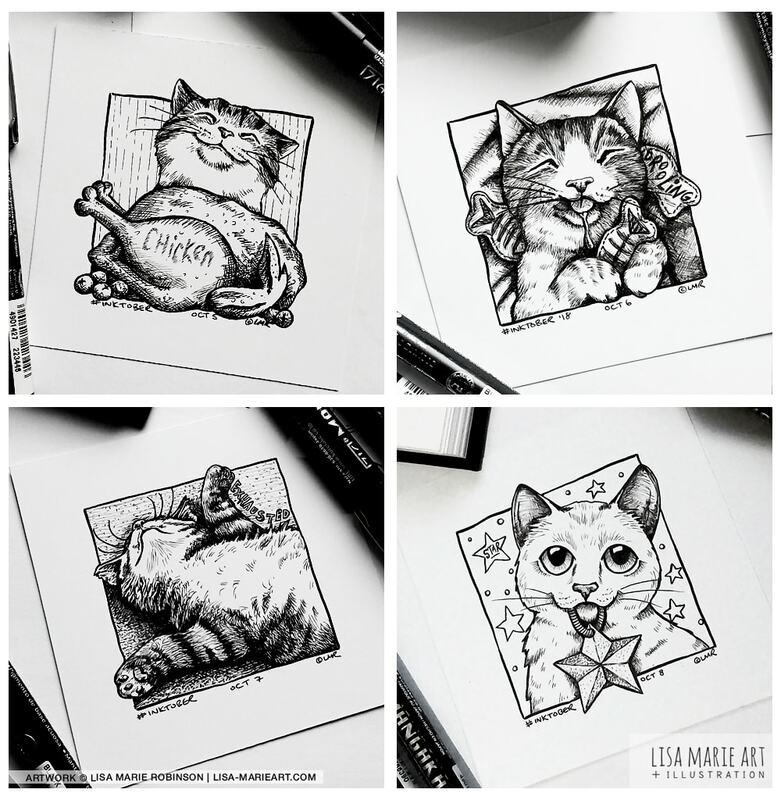 Each one has a paper size of 4 x 4 inches. All you receive is the drawing. No mount or frame. P.S. 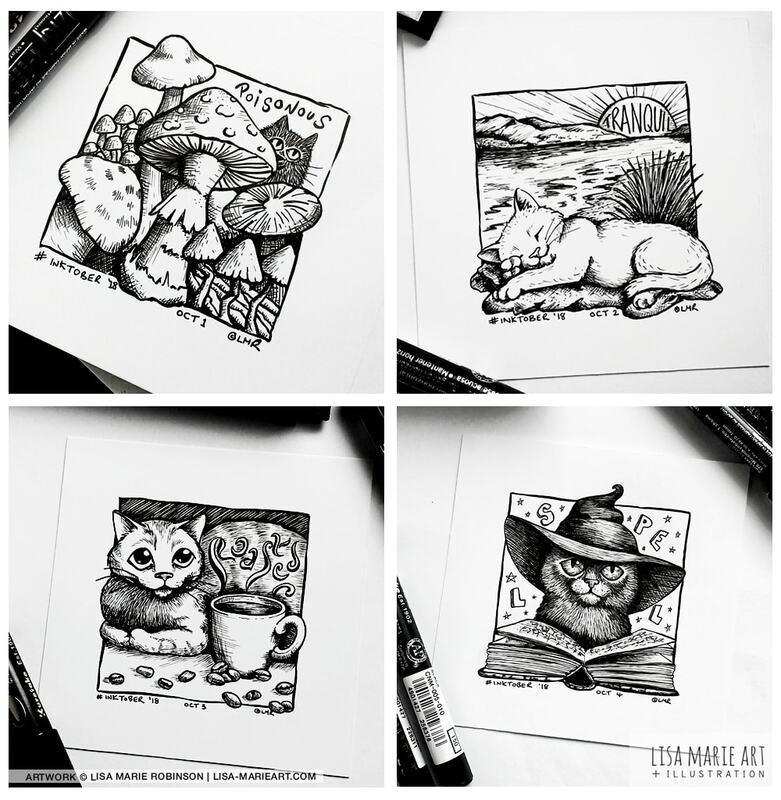 Day 2 (Tranquil), Day 5 (Chicken), Day 6 (Drooling), and Day 7 (Exhausted) have sold.